I began this blog in June I believe, but it isn't my first attempt at a book review blog. However, I intend to follow through with this one! My favorite part about blogging would definitely be being able to find others that have the same passion as you do. And the fact that you're able to discover some new books is a plus. I prefer YA books and I tend to veer toward paranormal, sci-fi and dystopian books, but I sometimes like to read adult books as well. I'm also big on blogging about eBooks to help promote them and their authors. I really love twisted, creepy stories, so Coraline, the Devouring Series and the Morpheus Road Trilogy are a few of my favorites. I also love the Host by Stephenie Meyer, even though it's more of a science fiction novel. The best thing about having my book blog is that I get to share what I love with people who care. I could tell my friend and family about an awesome new novel and they run in the other direction ha ha. But with blogging, there are people out there who like the same things I do and I love that. I am not as good about other social networks as I should be. 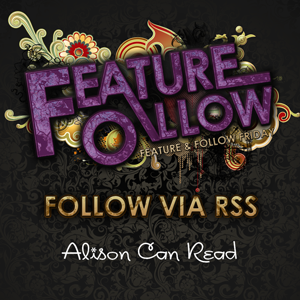 I like Twitter (@alisoncanread), but don't spend a huge amount of time on it. I'd like to do more because I know it can be a good resource for promoting your blog as well as a lot of fun. I have a blog Facebook page but I don't use it for anything more than posting links. I'd like to get more into Pinterest. Are any of you into Pinterst? I spend most of my time on Facebook. I only do Pinterest when The Voice is on and I am killing time during commercials. I don't even have a Pinterest account. It looks great but I don't think its for me. Old follower, not in the literal sense ;-) stopping by to say hi. I typically use Twitter and Facebook, Twitter more so. Hope you have a lovely weekend Alison. Me too. Blogger is my social network! I have a twitter account but my app hasn't been working the past few days. Driving me nuts! I picked Twitter. I have a feeling it's going to be a popular choice this week. I had to pick Twitter because I've been enjoying it a lot more since I started blogging. It's such a great way to meet new people! Pinterest is awesome for finding inspiration for just about anything. Bookrelated I keep a board of completed book series on pinterest. It is really fun to see what I've finished and motivates my to finish more series I have half read ;). I just now getting into twitter. Great way to promote posts and see other people's random thoughts! Hey I just wanted to say Hi because I am new to the Friday hop! Hi! I'm new to Feature & Follow Friday and I'm new to blogging. Here is my F&F! Oh, and my favorite social networking site is Goodreads...that counts, right?